PRI Rail Mounted Fixed Front & Rear Sights. PRI Rail Mounted Fixed Front & Rear Sights. 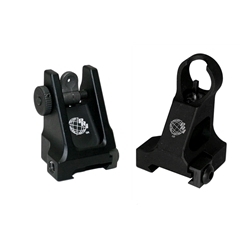 PRi's fixed front and rear sight are constructed T6 hard coated black anodized aluminum. Rear sight has windage knob for side to side adjustment, while front has a standard A2 post that allows for elevation movement. Both sights are set at 1.4" elevation. Sights together weigh .22 lbs or 3.5 ounces.